Draw 2 dots, one at upper right of a small square and one at the lower left of that same square. Don’t draw this flush with the upper left corner of the paper, go in at least 3 small squares in each direction. Draw a dot 2 squares to the right and hoop to the previous dot. 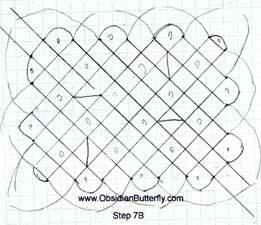 Continue to draw a dot every two squares and hooping every other set until you've reached the desired width. 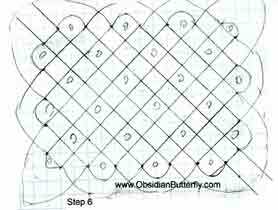 After the last UNHOOPED pair, drop down one square and to the right one square and draw a dot. Continue down the side, following Step 3. For best symmetry, end this corner so the corner is unhooped. Finish with the last two sides. 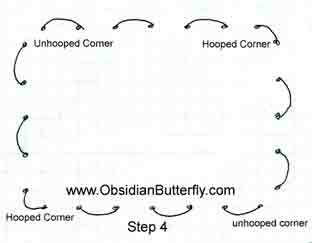 You should have 2 hooped corners and two unhooped corners. Connect all dots with 45 degree lines. Note that the two unhooped corners will be the open ones, where the ribbon extends outward. Extend those first. 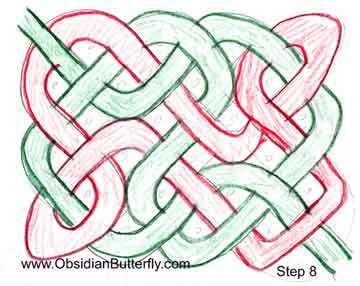 Then draw large arches over each smaller hoop. 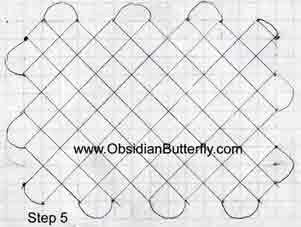 The corners will be tricky; look at the sample drawings for how to extend and hoop them. Lightly dot inside each arch and in every other diamond shape across each ribbon, to mark the open spaces. A. 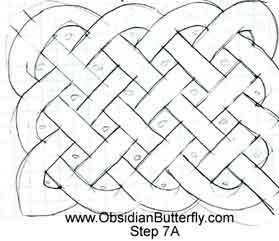 If you're new to knotwork, first create the over/under lacing (by erasing lines). B. If you're experienced, choose your breaks. Whichever you didn't do in #7. Then fix up your knot. When you are happy with it, go over the lines in ink and crosshatch the dark spaces.